The classic KitchenAid® stand mixer. What more need I say! This baby comes with a tilt head design, flat beater, whisk beater and a dough hook. It also have the legendary attachment hub out front of the power head for all of your future attachments. Unlike most stand mixers where you are used to seeing two beaters, these stands only use one beater that does the work of two. It actually spins in two ways – the standard spin, but then also a rotation of the spinning paddle which moves it all around the bowl. It is tough and durable for mixing bread dough of all types as well. 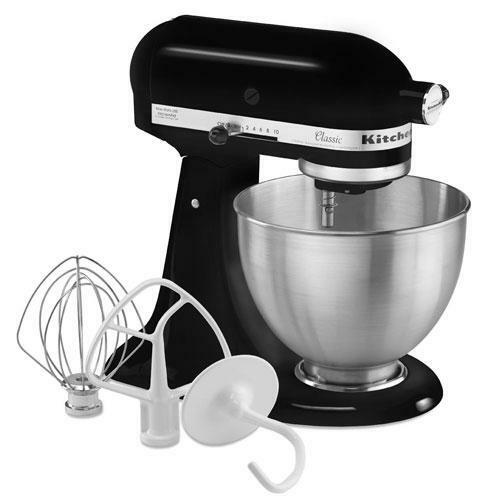 This is the base model of the KitchenAid® mixers, but it is fabulous all on its own and well worth the investment! As with all KitchenAid® attachments, clean these by hand to avoid any sort of dishwasher wear and tear or discolouration of the steel. I recommend buying this online if you can – you are likely to get a better price than having to shop around to your local stores. You can also be confident you are not getting a returned item off of the shelf in a store – especially when you are working with motorized parts, things that could have been in someone else’s dishwasher (yuck), or just in case someone returned a lemon that got restocked. Let the post man do all of the work. Then, ensure that you register your model with KitchenAid® online for warranty purposes. Way better than returning to the store. They simply ship you a new one – the same model or the next step up – if there are any issues.